Some 60,000 people gathered at one of the biggest parks in Tokyo on Sept. 19 to raise their voices and to call for abolishment of all nuclear power plants in Japan. This is one of the largest rallies Japan has ever seen in its history. 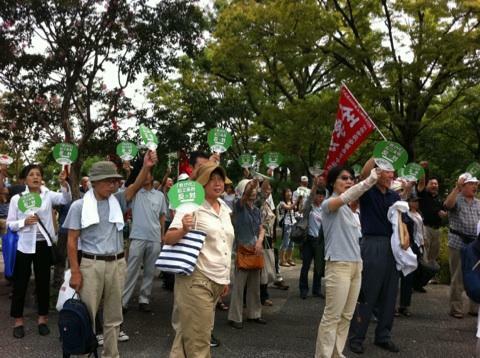 Japanese Nobel laureate, Kenzaburo Oe, said in his speech that humans cannot co-exist with nuclear energy in its state and a demonstration is a means for the public to show its dissatisfaction in government policies. I visited the Information Center for the Fukushima Network to Protect Children from Radiation in Fukushima City on August 1st. 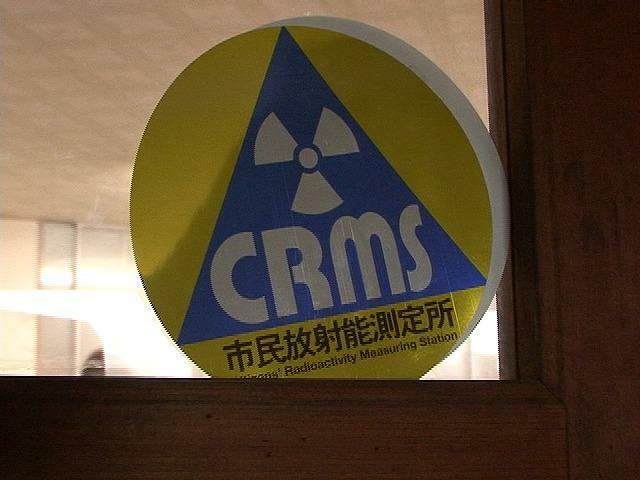 The Network was formed on May 1st and is active in four sections; evacuation & recuperation, measurement & de-contamination, information & education, protection from radiation. 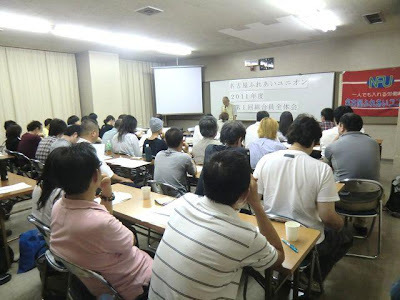 Nagoya Fureai Union, a community union on an individual affiliation basis in Aichi Prefecture, held a general meeting on August 27th. 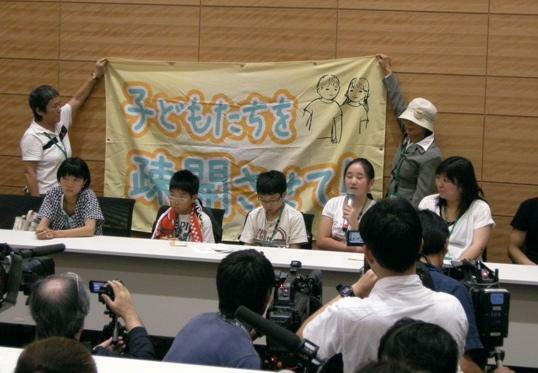 The meeting resolved to participate in the 9.19 Goodbye to Nuke 10 Million Action in Aichi to be held at Shirakawa Park from 1:30 p.m. and to take part in the No Nukes 10 Million Signature Campaign proposed by Oe Kenzaburo and other celebrities. The union had already held an open seminar on nuclear power plant issue on July 30th and raised consciousness of its members. The steering committee urged the general meeting to raise their voices in the No Nukes actions and was enthusiastically approved the members. “Down with Kimigayo Ordinance!””Down with Hashimoto!”, chanting echoed around the Osaka Prefectural Government Office, on August 22nd. Educational workers nationwide gathered to surround the Office in protest of the Osaka Prefectural Governor, Hashimoto’s coercion to make teachers stand for the national anthem, Kimigayo. The participants of the protest meeting marched around the building, with more than 10 union flags and big fans with the slogan “No to Kimigayo Coercion Ordinance” in their hands. 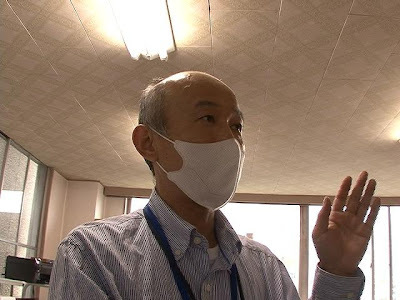 The demonstration was only for 30 minutes, but the Osaka government office quarters was filled with the voices against reprimanding teachers who refuse to stand for and sing Kimigayo. The action was the first of the string of actions for the September Prefectural Assembly Meetings and heralded the start of the Osaka Fall Action. The National Support Committee for the Reinstatement of Japan Airline Workers and the plaintiffs met with the government on August 16th. They submitted the signatures for the reinstatement of the dismissed workers and urged the government to take necessary measures to solve this unfair dismissal case, following the Tokyo Metropolitan Labor Commission decision which recognized the dismissal as an unfair labor practice. This meeting was attended by representatives from JAL Cabin Crew Union, Japan Federation of Aviation Workers’ Union, JAL Flight Crew Union and Zenroren. The plaintiffs and the Support Committee will continue the struggle and demand the government to promptly settle the case.